The Low Spin: elevating and driving the return with the hips and shoulders. In the last article, we looked at the Contact Move for the first type of rally return, what I call the Two Foot Pivot. (Click Here.) Now let's look at the other type: the Low Spin. By rally return I mean a return in which the player is trying to neutralize the effectiveness of the serve. This often means the serve has forced the returner on time, or jammed him with the ball location. At most the serve is hit 2-3 adjusting steps away. The returner's goal is to maintain his court position and get into the point on an even footing. On the groundstrokes, we have described the Low Spin as an aggressive contact move. But on the return of serve, it is used as a rally move. Why? The difference is where the player makes contact. A return is hit from the corner of the court where you are in a potentially vulnerable court position. So the idea is not to attack but to get into the point on an even footing. The Low Spin can be hit on either the forehand or backhand side. But compared to the two foot pivot, it is usually hit on a slighter higher ball. As with the low spin the player rotates the hips and shoulders to drive the shot, but also elevates slightly into the air using more leg drive and/or adjusting to the ball height. Sometimes the player may also move back substantially on this return before setting up for the rotation. So, as we have for the other return contact moves, let's go over the components involved in hitting a great Low Spin Return on both sides. The player can take a step out, or a reverse pivot step to start the low spin. Typically the returner uses a Low Spin contact move on a ball hit directly at him, or within a distance of one or two steps. The serve is hard and fast and relatively low bouncing, but still higher at contact compared to the Two Foot Pivot. This means the player uses more upward leg drive and leaves the ground by a few inches with both feet. With the Low Spin the player can take a variety of out steps. The out step can be pivot step in the direction of the ball with the outside foot. Or it can be a larger step out in the direction of the ball. The player can also make a reverse pivot step away from the ball when the serve jams the body. The Low Spin can be hit from either an open or semi-open stance. However, I feel that the Low Spin is more effective from a semi-open stance, and players should work to use this whenever possible. Remember you are “only as good as your stance,” so work to set up the best stance on every ball whenever possible. In a good semi-open stance, 65 percent of the weight should be on the back or outside foot. The feet should turn at least 45 degrees up to 90 degrees so the feet are pointing to the side fence. The outside knee is dropped down for balance and to load the legs. The low spin return uses the unitary rotation of the hips and shoulders to drive the swing. On the Low Spin contact move, the hips stay low and rotate around a central axis. The torso and legs drive the shot rotating as a unit. The body becomes slightly elevated after contact, and the outside toe finishes pointing in the direction of the hit. The low spin is challenging athletically and from the timing point of view and is the one of hardest returns to master. When completing the low spin, be careful not to over-rotate, or jump up too much, and always keep the head still. With the Low Spin return, keeping the knees bend through contact is essential to maintain balance. A good sign of a well completed low spin is when the outside foot is flat on the ground and the body remains centred and well aligned. The player should sink down into their athletic base after contact. If you hit down the return down the line. to recover for a sharp angled you should definitely use a crossover recovery step. This means the outside leg crosses in front of the leg that is closest to the center of the court. The crossover is faster and covers more ground than the side skip recovery steps, but is harder to master. Ideal low spin components: outstep, stance, airborne rotation, balanced landing, crossover recovery. Watch in the animation how the player executes a virtually perfect forehand low spin contact move. It starts with a pivot step. Then adjusting steps to set up a semi-open stance. The player then rotates the hips and shoulders through the shot, coming off the court with both feet. She stays flexed in the knees as the rotation continues and lands on balance. This is followed by the preferred crossover step with the outside foot to start the recovery. Although this semi-open stance is the preferred set up, it is important to note that when the ball comes faster, there may not be time so players must be ready to hit a Low Spin return with open stance as well. The best way to crossover is to drop the opposite leg back slightly to clear the way for the outside crossing leg. Over short distances the side skip can always be used especially if you have directed your shot cross court. But with practice, you may find that when the low spin is correctly executed, the cross in front recovery step happens almost automatically. The same elements on the backhand side: set up stance, rotating off the court and through the ball, crossover recovery. On the backhand return, we can see all the same elements when players use the Low Spin contact move. In the example here, we can also see how the player may move back, further away from the ball before initiating the move. Again, the player can turn sideways with a variety of possible out steps, pivot step, step out, or reverse pivot. He then sets up with some version of an open stance. From this set up, he unleashes the hip and shoulder rotation, driving upward into the air and around and through the shot. However the legs don't fully extend and stay flexed. The landing is balanced with the knees still bent. After the landing he begins the recovery with a front crossover step. On either side, returns with the forehand or the backhand, the Low Spin move is an important return variation. Players need to master the low spin and well as the two foot pivot to neutralize strong serves. Hitting neutral returns are critical in many situations where trying for more aggressive plays will likely result in errors. They also allow players to reduce the number of defensive returns they hit by giving them a middle option. Pay attention to the contact move patterns you use on your returns, and make sure they correlate with the type of strategic return you are hitting. 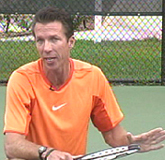 David Bailey is a native Australian who has spent 15 years studying tennis at the professional level. He has developed a new language for one of the most complex and misunderstood aspects of the game, footwork and court movement. David has worked with world class players and coaches, national tennis associations and top academies, and has presented at coaching seminars around the world. 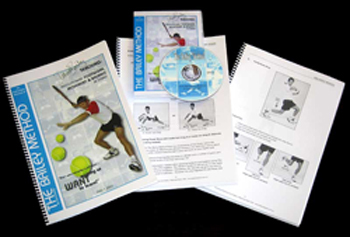 His teaching system, the Bailey Method, has become a regular part of the coaching curriculum at the Nick Bollettierri Tennis Academy, where it is personally endorsed by Nick. You can find out more about David, his players, his succeses, and his training methods at www.TheBaileyMethod.com. Want to Train in the Bailey Method?